BY DAN TABOR FILM CRITIC Everyone I know seems to have a Harmony Korine story. From the friend who once told me about how an applicant at the video store he used to work at listed the director as a reference — and how they called the number only to have Korine pick up. To another friend in whom Korine confided that he once lost almost 70 never-produced scripts in a bizarre house fire. Like the director himself, The Beach Bum is a study in larger-than-life chaotic personae that has been carfefully curated over the years and how it has affected those around him. Inspired by the music of Jimmy Buffett and starring the likes of Snoop Dogg, Jonah Hill and Martin Lawrence, The Beach Bum is a straight-up comedy with a non-ironic feel-good vibe that will surprise those who’ve come to expect hipster transgression from Korine. 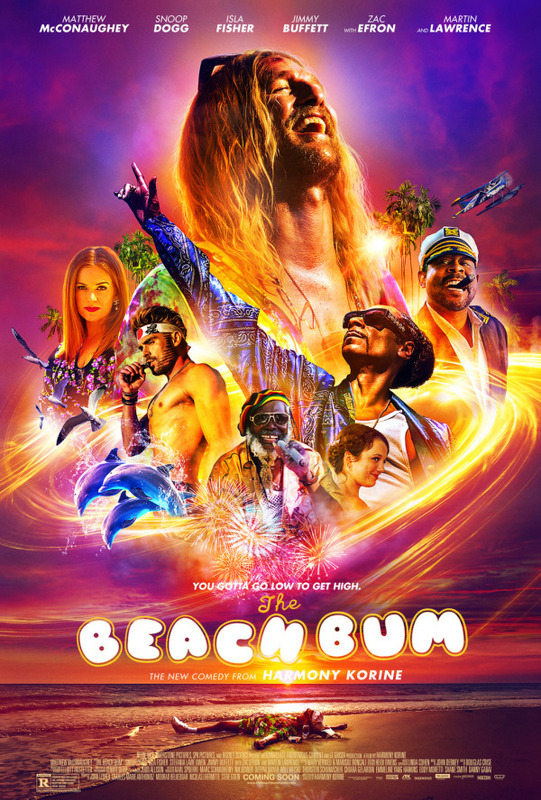 Taking place on the same opulent, neon-soaked shores of Florida as Spring Breakers, The Beach Bum stars Matthew McConaughey as the oddly charismatic and mischievous poet Moondog who spends all his time writing, seducing women, drinking PBR and smoking insane amounts of weed. Everyone loves Moondog, who leads a rather charmed existence with his very wealthy wife Minnie (Isla Fisher), whom he shares a open relationship with. When Moondog is summoned back to Miami for his daughter Heather’s wedding the night is punctuated by his wife dying rather tragically. Moondog is left her entire $50 million fortune on the sole condition that he has to finish his latest book of poetry that he’s been toiling over for years. The plot of The Beach Bum sounds like something out of an 80’s stoner comedy, and Moondog’s world is populated by the kind of colorful characters you would probably expect from that bygone genre. My personal favorite being Martin Lawrence’s Captain Wack, a PTSD-suffering Dolphin Tour guide who has a coke addicted parrot and can’t tell the difference between sharks and dolphins. Moondog himself is definitely odd, but the character’s tenderness, depth and whimsy genuinely win you over. We view this Lebowski-on-the-beach fantasia through the prismatic lens of cinematographer Benoît Debie who turns The Sunshine State into a iridescent flesh-toned fever dream. The Beach Bum is hilarious, quirky and the yin to the nihilistic yang of Spring Breakers. The film also feels oddly autobiographical, with McConaughey’s aging enfant terrible an allegorical stand-in for the 46-year-old Korine who will forever be infamous for writing Kids into instant-notoriety back in 1995 and trying to simultaneously live it down and live up to it ever since. If you’ve perused Korine’s recent press run for the film there is always a point where he is tasked with addressing his bizarre past, which has become the stuff of indie urban legends. The Beach Bum is easily Korine’s most accessible work to date and a film that could become a touchstone performance for McConaughey who really does something special in realizing Moondog and making you believe his hustle. This entry was posted on Friday, April 5th, 2019	at 12:29 am	and is filed under News	. Responses are currently closed, but you can trackback from your own site. « GEEK SQUAD: Shazam! Reviewed!